South Florida Filmmaker | \ Video of the Week \ Video of the Week: Tony Scott's "Beat the Devil"
Back in 2001, BMW released a branded series of successful online short films to promote their automobiles (mostly the Z4 Roadster). Directors John Frankenheimer, Ang Lee, Guy Ritchie, and Alejandro González Iñárritu contributed to the first series of short films, which helped BMW increase sales by 12% over prior year. The revolutionary series of films, each featuring "The Hire" played by Clive Owen, continued in 2002 with short films by John Woo and Joe Carnahan. 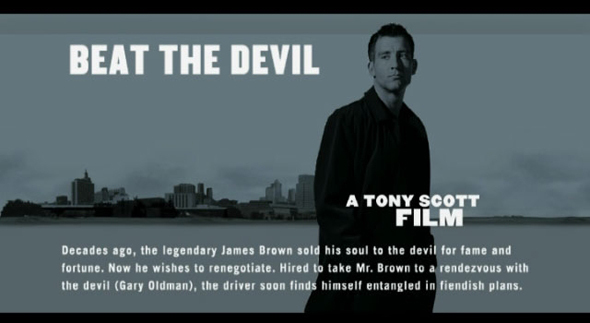 This week, We continue our tribute to director Tony Scott with the short film that kicked off the 2002 series, "Beat the Devil". In the film, James Brown (playing himself) wants to renegotiate the terms of his contract with "The Devil" (played by a hysterically sinister Gary Oldman) who he sold his soul to back in his youth in exchange for stardom. Brown suggests that his Driver (Owen) race Lucifer’s driver (Danny Trejo), from the Vegas strip out into the desert. Director Tony Scott unleashes his trademark fragmented frenetic camera style to create 9 minutes of cinematic sensory blast.